NEI has introduced UV-Protect (UVP) technology to formulate enhanced versions of its popular NANOMYTE® coating products, which offer unique functionalities in coatings with unparalleled durability. The NANOMYTE® line of protective coatings and surface treatments provide tailored functionalities, such as hydrophobicity, superhydrophobicity, oleophobicity, superoleophobicity, self-healing, fog resistance, self-cleaning (or easy-to-clean), scratch resistance, anti-corrosion, and anti-icing. They have found wide applicability in the industrial and automotive markets for their versatility and ability to be applied to a variety of surfaces – including glass, plastic, fiber-composite, metal, and ceramic. UVP technology imparts enhanced protection from the effects of sun and weather exposure to maintain the unique properties of their coating products when subjected to long-term outdoor exposure. NEI Corporation is an application-driven company that utilizes nanotechnology to develop and produce advanced materials. The company’s core competencies are in synthesizing nanoscale materials and prototyping products that incorporate advanced materials. NEI offers an array of Advanced Protective Coatings for metal and polymer surfaces, with tailored functionalities such as anti-corrosion, self-healing, scratch resistance, ice-phobic, and self-cleaning. Somerset, New Jersey (USA) – NEI Corporation announced today that it has introduced UV-Protect (UVP) technology to formulate enhanced versions of its popular NANOMYTE® coating products, which offer unique functionalities in coatings with unparalleled durability. The NANOMYTE® line of protective coatings and surface treatments provide tailored functionalities, such as hydrophobicity, superhydrophobicity, oleophobicity, superoleophobicity, self-healing, fog resistance, self-cleaning (or easy-to-clean), scratch resistance, anti-corrosion, and anti-icing. They have found wide applicability in the industrial and automotive markets for their versatility and ability to be applied to a variety of surfaces – including glass, plastic, fiber-composite, metal, and ceramic. UVP technology imparts enhanced protection from the effects of sun and weather exposure to maintain the unique properties of their coating products when subjected to long-term outdoor exposure. NANOMYTE® coating products with UVP technology have demonstrated their ability to endure a minimum of 1,000 hours of weatherability testing per ASTM D4587, “Accelerated Weathering under Fluorescent UV-Condensation Exposure.” The testing was performed in a QUV chamber under the conditions specified in ASTM G154, Cycle 1, the most commonly used exposure cycle designed to simulate severe outdoor service conditions. The UVP functionality has been incorporated into each coating system without degrading other performance characteristics or ease of application. The cured film is both inherently resistant to the sun’s UV radiation, as well as capable of providing UV protection for the underlying surface. This, for example, allows the NANOMYTE® MEND product line to maintain excellent gloss and appearance in outdoor applications, such as automotive coatings. Polymer and composite materials can be particularly sensitive to the effects of UV exposure, which can have a variety of undesirable effects, beginning at the surface and often spreading throughout the bulk of the material. Surface attack immediately begins to compromise coating adhesion, eventually resulting in cracking and peeling. UV-degraded materials may also change colors, often resulting in the familiar yellowing of plastics and lose mechanical strength, making them prone to failure. UVP coatings block UV radiation, which protects surfaces by preserving coating adhesion and aesthetics, and prevents further penetration of UV light which can compromise the material’s strength and appearance. Outdoor exposure can present additional challenges for surfaces to resist buildup of dirt, airborne contaminants, corrosion, and even ice. NEI’s line of durable protective topcoats, formulated as one-component, ambient-cure systems for ease of use, now offer UVP technology to extend their performance and shield sensitive surfaces. NANOMYTE® SR-500EC-UVP can protect a wide variety of surfaces from the effects of outdoor exposure, coupled with an easy-to-clean functionality with enhanced weatherability. For surfaces prone to icing, NANOMYTE® SuperAi-UVP not only helps keep surfaces clean, but also enhances their ability to shed ice buildup, all while providing excellent protection from the elements. 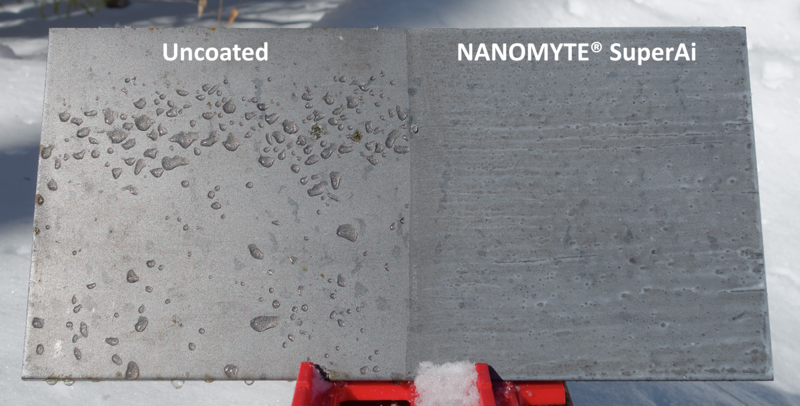 Both of these coatings can maintain excellent hydrophobicity, with a static water contact angle of 100 – 105°, even after 2,000 hours of QUV exposure, while NANOMYTE® SuperAi-UVP maintains a low ice adhesion value of less than 1 psi after more than 1,000 hours of exposure. NANOMYTE® TC-4001-UVP and TC-5001-UVP have been optimized for metals to form a hard, durable coating with excellent barrier properties to prevent moisture penetration and corrosion. NEI’s coating products featuring UVP technology can be applied by conventional processes, such as dipping, brushing or spraying. NEI also offers in-house coating services for customer’s parts, as well as coating development services, wherein coating formulations are created to address specific customer requirements. The development of NANOMYTE® UVP functional coatings has come about as a result of NEI’s capabilities in creating functionalized nanocomposite coatings. In addition to imparting protective and aesthetic properties, NANOMYTE® coatings lead to gains in productivity and efficiency and therefore can be used in many applications that traditionally have not used paints or coatings. Somerset, New Jersey (USA) – NEI Corporation announced today that it has enhanced the performance of its anti-ice coating, NANOMYTE® SuperAi, and confirmed its efficacy through rigorous testing under a variety of icing conditions. SuperAi is a nanocomposite coating that imparts anti-ice properties to the underlying substrate. As a consequence of the engineered properties of the anti-ice coating’s formulation, it reduces ice buildup on surfaces, and provides a hard, dense, smooth finish. Surfaces treated with NANOMYTE® SuperAi exhibit reduced ice adhesion, thereby reducing ice buildup. 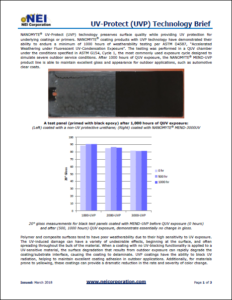 Precisely calibrated Ice Adhesion measurements showed that SuperAi has an Ice Adhesion Reduction Factor of greater than 5 (relative to a polished metal surface), indicating that NANOMYTE® SuperAi reduces the adhesion of ice by more than 80%, compared to smooth, bare metal and painted surfaces. The performance remains unaltered after repeated icing-deicing cycles, as well as after mechanical abrasion. Further, Icing Wind Tunnel experiments showed that SuperAi allows ice to be removed with minimal force, confirming its usefulness under practical use conditions. NANOMYTE® SuperAi can be applied to a variety of substrates, including plastic, metal, glass, and ceramic. In some instances, a suitable primer may be required for long term durability of the anti-ice coating. SuperAi is a single component coating that is easily applied by spray or brush. The dry film thickness can be adjusted to be in the range of 5 – 25 microns (1/5th to 1 mil), and only one coat is required to cover the substrate. 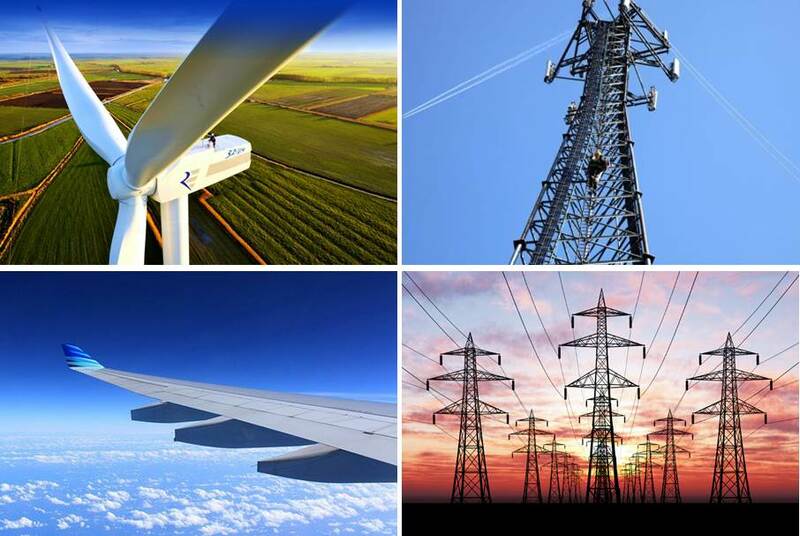 Current applications include occurrences where ice removal is a challenge (e.g., wind turbine blades, power transmission lines and cables, cellular phone towers, windshields and other glass surfaces in automobiles, aircraft wings, and unmanned aerial vehicles, UAVs). SuperAi also provides corrosion protection, which is an added benefit. The use of SuperAi enhances productivity for the user and provides rapid payback, as well as a good return on investment. Contact us to obtain detailed test results on NANOMYTE® SuperAi. Somerset, New Jersey (USA): NEI Corporation announced today that it has introduced NANOMYTE® SuperAi – a nanocomposite coating that imparts anti-icing properties to the underlying substrate. The transparent coating also provides a hard, dense and smooth finish. Surfaces treated with SuperAi exhibit reduced ice adhesion, thereby preventing ice buildup. SuperAi can be applied to a variety of substrates, including plastics, metals, glass, and ceramics. In some instances, a suitable primer may be required for maximum adhesion of the anti-ice coating. NANOMYTE® SuperAi is a single component coating that is easily applied by dip, spray, or brush. Potential applications include occurrences where ice removal is a challenge (e.g., wind turbine blades, power transmission lines and cables, windshields and other glass surfaces in automobiles). The coating also provides durability and additional corrosion protection. The figure below is an example of how SuperAi can eliminate ice buildup on a substrate. SuperAi is uniquely engineered so that the treated surface becomes highly slippery and hydrophobic, which facilitates the reduction in ice adhesion. Data obtained so far by our customers and collaborators indicate that SuperAi is effective in mitigating buildup under icing conditions. For example, in a simulated industrial trial, ice accretion on coated and uncoated aluminum conductor cables were measured. The outside of one cable was coated with SuperAi. Both coated and uncoated conductors were subjected to icing conditions for two hours under a regulated spray of water and ice solution at fixed time intervals. Ice accumulation was determined by weighing the cables before and after the test. It was established, in multiple test runs, that the ice accretion was reduced to half with application of the coating. Similar results were obtained on sections of a wind turbine. In addition, in-house measurements of ice adhesion strength with a force gauge show that SuperAi reduces the adhesion tendency significantly. NANOMYTE® SuperAi can be applied on clean surfaces using a commercial high volume, low pressure (HVLP) spray gun. The coating can also be applied using a roller or brush, where coating is done in a cross-pattern; left to right, then up and down as quickly as possible since the coating dries quickly. SuperAi can be cured at room temperature by exposing the coating to ambient conditions for 6 to 8 hours. Accelerated curing is achieved in 1 hour or less at temperatures in the range of 100 – 150°C. NANOMYTE® SuperAi is available in one liter bottles, 5 gallon pails, and 55 gallon drums. NEI Corporation is an application-driven company that utilizes nanotechnology to develop and produce advanced materials. The company’s core competencies are in synthesizing nanoscale materials and prototyping products that incorporate the advanced materials. NEI offers an array of Advanced Protective Coatings for metal and polymer surfaces. The coatings have tailored functionalities such as anti-corrosion, self-healing, scratch resistance, ice-phobic, and self-cleaning.